South Korean President Moon Jae-in on Sunday offered words of condolences on the death of former United Nations Secretary-General Kofi Annan. "We lost a dear friend who walked an exhausting path to peace," he said in a SNS post. "We extend our sympathies (to the family) with saddened hearts and pray for his soul." 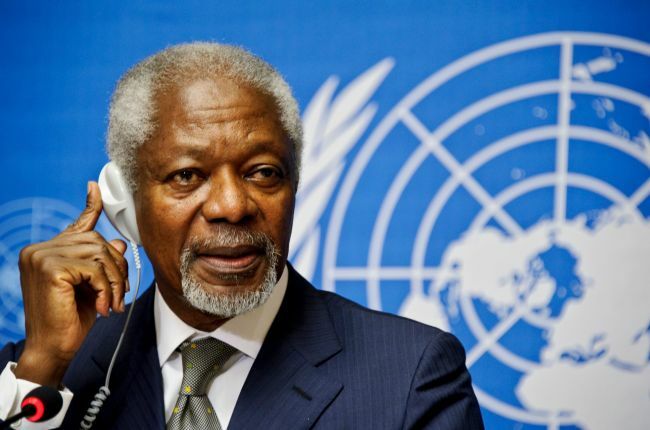 His remarks come a day after Annan's death was announced by media worldwide. Annan headed the UN from 1997-2006, before Ban Ki-moon, a South Korean diplomat, took over his post. Annan won the Nobel Peace Prize in 2001 and is known in Korea for his endorsement of late South Korean President Kim Dae-jung's engagement policy for North Korea known as the Sunshine Policy. "Where there was conflict, Mr. Annan was there, and talks began," Moon said. "We will carry in our hearts his support for peace on the Korean Peninsula."